Serial #'d to ONLY 08/99. EJ MANUEL ROOKIE CARD. CARD NUMBER #13. To CANADA. # 23.E.J. Manuel. 2013-14. PANINI . FOOTBALL. This card is great, very thick and you can feel the jersey. It's almost like 3D. Great color and only 99 exist ! Many OlderSports Magazines. E J Manuel. 2013-14.NFL PANINI . FOOTBALL. 2013 Panini Rookies & Stars EJ Manuel CRUSADE ROOKIE insert card ! MAKES A GREAT GIFT FOR ANY BUFFALO BILLS FAN! New cards listed every week!All cards are at least nm/mt condition or better, unless otherwise noted. 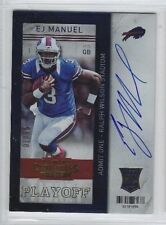 EJ MANUEL 2013 CERTIFIED ROOKIE JERSEY AUTO "RED #'rd !! NICE Rc JERSEY AUTO !